"Activities for Regional Development Utilizing Domestic Timber in the Field of Education"
Design Senior Manager of Technical Design Center, UCHIDA YOKO CO., LTD. Designer, Technical Design Center, UCHIDA YOKO CO., LTD.
Director of Planning & Designing Dept. これらの経緯を踏まえ、宮崎県と日向市の都市計画関係者は将来の街を担う次世代層の子供たちに一層の関心を持ってもらうために、まちづくり課外授業を再度開催することを計画した。小学校における総合学習の枠組みを利用した「日向市活性化塾」が企画され、実際進行しているまちづくり事業や地域産業と直接関わりを持った学習が実現することになった。 Starting in 1996, the officials and residents of Hyuga City, Miyazaki Prefecture, began working together on urban development with the objective of regenerating the charm and prosperity of the city center area. A number of improvement projects that connect the government and the private sector are proceeding; Continuous Elevating and Crossing Project of the JR Nippo Line at Hyuga City Station (Miyazaki Prefecture), Land Readjustment Project of Hyuga City Station Area (Hyuga City) and Special Commercial Improvement Projects (Private Sector). 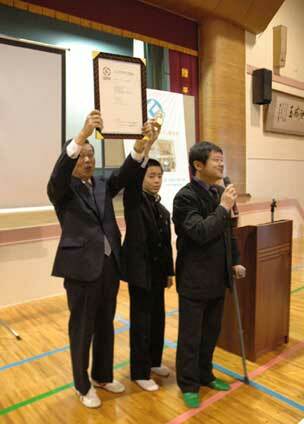 Miyazaki Prefecture is proud to be Japan’s number one producer of cedar for over ten years. Lumber use is promoted all over the prefecture and Hyuga City has made “building our city on the culture of trees” their theme. Built using lavish amounts of local cedar, JR Hyuga City Station was completed in December 2006. A comfortable space was created and it has gained popularity with the residents as a new symbol of the city. Hyuga Station is just one example of the many projects using local lumber that are proceeding in the city center. Various trials were run in Miyazaki Prefecture and Hyuga City to involve residents from the early planning stages of urban development projects. When the residents are involved they develop a stronger sense of attachment and pride for their cities. As part of these trials, the Tomitaka Elementary School, located in the central area of Hyuga City, held their first extracurricular urban development course called “Urban Development: Connecting to the Next Generation” in 2002. Professor Osamu Shinohara (National Graduate Institute for Policy Studies), and Professor Hiroshi Naito (Tokyo University) who are deeply involved with the urban development of Hyuga City, taught this course. 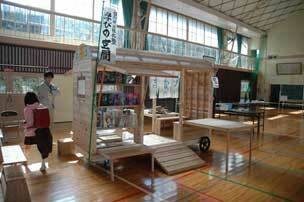 In this course, children thought about the image of their town in the future and they made models. This course was introduced in two local newspapers as a new study on urban development education and got a tremendous response in the area. The individuals involved in city planning in Miyazaki Prefecture and Hyuga City planned to hold extracurricular classes again to stimulate interest among the next generation of children who will become the caretakers of the city in the future. The “Hyuga City Revitalization Course”, which fit into the framework of general education at the elementary level school, was planned. The course was set up so that students could have direct contact with local area industry and urban development projects actually in progress. 課題となったテーマは地元にある杉材でつくる「移動式夢空間」。お祭りやその他地域のイベントで街の人たちと一緒に楽しくふれあえる移動式の「屋台」の実物を実際につくり、使ってみるところまでを体験するというかなりの時間を必要とするものになった。 The urban development course that was reopened in 2004 at the Tomitaka Elementary School was called the “Hyuga City Revitalization Course”. The course was designed to increase student interest in the development of their city, to understand the problems the city is facing, to think about what should be done to make a better and more pleasant city, to help students think for themselves, to learn how to turn ideas into tangible form and to go thru the process of creating something that can actually be put to use. 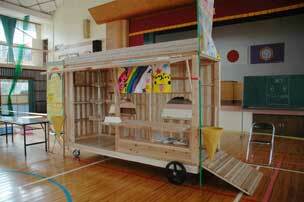 The main theme became the creation of a “Movable Dream Space” made using local cedar. The project was to actually build movable “Yatai” (food stalls) that could be used for enjoyable interaction between people at local festivals and at events with visitors from other areas. Once we started building the Yatai, we realized it was going to be a lot of work. Table 1 is the course program. このまちづくり課外授業のユニークなところは、教育の現場からのアプローチではなく、実施主体として宮崎県と日向市の都市計画関係者が企画し、富高小学校が意欲的に受け入れている点にある。さらにこの授業を実施運営するにあたり、木材関係者の組合である日向木の芽会を中心に地元の人々が材料の供給および実物の製作、資料の作成等に協力しており、この企画を実現する上で重要なキーファクターとなっている。 A unique element of this extracurricular urban development course was that the planning for the course didn’t come from the educational community but from the city planners working for Miyazaki Prefecture and Hyuga City. Tomitaka Elementary School’s eager acceptance of the course is also noteworthy. In addition, the Hyuga Kinome Association Lumber Union and local residents provided lumber, helped with construction as well as document creation, which were important factors in the success of this project. この学習において前回の課外授業と同様に外部講師を起用することとなり、既に日向市のまちづくり事業において杉材を活用したストリートファニチャー（街路灯、ベンチ等）のデザイン・製作を行っていたプロダクトデザイナーの南雲勝志を中心に若杉浩一、千代田健一の３名のデザイナーが担当。その他、実際の日向市のまちづくり事業に関わっている都市計画、土木設計、建築設計等のまちづくりの専門家が多数加わり、この授業をサポートし、現在進行中のまちづくり事業に繋がる具体的なものづくりの実践となった。 As in the previous course, guest instructors were invited. The three designers who had already been working on Hyuga urban development, designing and producing street furniture (street lights, benches…), Katsushi Nagumo, joined by Koichi Wakasugi and Ken Chiyoda, managed this course. In addition, numerous city planners, public works designers, architects and other experts involved in Hyuga urban development were also involved in support for the course and acted as the main connection to current development projects.? この授業は企画段階から最終的に実際に使える本物を作って、使ってみるところまでが予定されていて、学習というよりは実際のものづくりを大人と一緒に行ったと言うことができる。児童たちはアイデアのディスカッション、ラフスケッチ、模型作り、製作のための設計、製作、運用までのものづくりのプロセスを一通りリアルに体験した。児童ではできないところを担当講師や地場の木材加工職人がサポートしただけで、デザインの根幹は全く児童たちで作り上げたところは特筆できる。作り勝手やコストのことを考え、設計に修正を加えようとする講師を始めとする大人たちに、妥協することなく立ち向かってくる児童たちの真剣さに触れ、大人も真剣味を増してゆくという、ものづくりにおいては好ましい関係・状況の中で進行した。そんな中、実際のものづくりの現場でも発生する様々なアイデアや想いを集約して絞り込んでゆくという困難な過程を見事にクリアして、クラスの案としてこれだけの期間でまとめあげられたことは賞賛に値する。また、最終的にできあがった3つの夢空間を自分たちでその利用方法を考え、飾り付けを施し、保護者や地域の住民の皆さんを相手に実際に使ってみることを通し、自分たちが作り上げたもののポテンシャルまでを体感することに成功している。 From the planning stages of this course, the objective was to make something that you could actually use. So, instead of studying ideas and concepts, students got to actually make something with adults. The children were able to experience the entire production process from discussing their ideas, drawing rough sketches, making models, creating designs for production, working on the production and finally putting what they produced to use. For certain things that the children couldn’t do, the instructors and local wood craftsmen were available for support, but it is worthy of special mention here that the main designs were all made by the children. When the instructors and other adults would try to suggest changes to the children’s designs to make them easier and cheaper to build, the students would not compromise and earnestly stood behind their designs. As a result, the adults also became more committed and the course proceeded with an environment and relationships conducive to creation and production. The difficult process of taking the various ideas that arise during the actual production process was handled perfectly, and the level to which the class was able to realize their plans, in this short period of time, is praiseworthy. In the end, three dream spaces were built, and the students came up with different uses and decorations for each of them. They also invited their parents and townspeople to come and try out what they had made, and as a result, they were able to experience the true potential of what they had produced. 自分たちのふるさとにとって地場産業のシンボルとも言える杉材を素材として使うという条件もこのプロジェクト成功の要因のひとつになっている。杉は日本全国至るところに分布しており、本来であれば利用しやすい材料であるが、生活スタイルの変化により本格的な木造住宅の需要が減ってきたこと、また安価な外国産材に圧されたりで日本の林業、製材業は苦境に立たされている。日向市においても杉にまつわる問題は同じで、地元では地場産業の再生を図ろうとして官民一体の取り組みをしている。その中で、日向市においても財産と言える杉材をまちづくりに活用してゆくことは地域全体の活性化に繋がる重要な課題であり、児童にとって杉はふるさと日向の魅力を再発見する上で最適な素材だったと言える。何よりも適していたのは、子供でも切ったり削ったりという加工を加えることが比較的やりやすい素材であることだ。自分たちで考えたものを自分たちでその一部を実際に製作をすることを可能にしたのである。 One of the reasons for the success of this project was the requirement to use the symbol of the local industry, cedar. Although cedar is an easy to use wood and can be found all over Japan, due to changes in lifestyle, the demand for wooden homes continues to decrease and the availability of cheap foreign materials has put the Japanese forestry and sawing industries in a difficult position. Hyuga city faces the same problems as the cedar industry, this is why the public and private sectors are working together for the regeneration of local industry. It can be said that cedar is an asset for the urban development of Hyuga city and is directly connected to the important revitalization of the entire area. For children, cedar is the perfect material to help them rediscover the charm of their hometown, Hyuga. Another important element is that cedar is a relatively easy wood to work with and even children can cut and plane it. This made it possible for them to actually take part in building what they had imagined. 製作した3つの移動式夢空間は発表会の後、日向市に寄贈された。地域でのイベントや祭り開催時には、市民からの申し出に応じて貸し出し、活用が図られている。日向市へ移管された後に行われたイベントで貸し出しを受けた市民が屋台のデコレーションに画鋲を使っていたことを児童が発見し、苦情を訴えたという微笑ましいエピソードがある。自分たちで作ったものへの慈しみとものを大切に使おうという気持ちを芽生えさせたこともこの授業の成果であると言える。 After the unveiling of the three Movable Dream Spaces, they were presented as a gift to Hyuga City. They are available for use by residents for events and festivals and they are getting lots of use. There is a heart-warming story of a student who discovered that some people who borrowed the Movable Dream Space used tacks when decorating it and he filed a complaint. Another positive result of this course is that the students could experience the new feeling of cherishing something that they have made and the desire to take care of it. 「日向市活性化塾」の一連の活動は、２００５年度のグッドデザイン賞（新領域デザイン部門）を受賞。デザイナーは平成１６年度ふれあい富高小学校６年生一同と記載されている。グッドデザイン史上初の小学生デザイナーによる受賞である。その審査評価には、「デザイナーが主体となり、行政、企業、学校、市民が一体となって活動している教育プログラムであり、幼年教育を、敢えてローテク機器を用いて活性化させようという取り組みには、社会的な意義がある。何より参加した誰もが元気になっている活動の成果そのものも評価できる。」とある。この受賞のニュースは地元新聞にも大きく取り上げられ、宮崎県や地域の住民だけでなく、教育関係者を始め、様々な分野から広く評価を受けている。 The “Hyuga City Revitalization Course” received the 2005 Good Design Award (New Frontier Design Category) for its activities. The design credit goes to the 2004 Sixth Grade Class of the Tomitaka Elementary School. 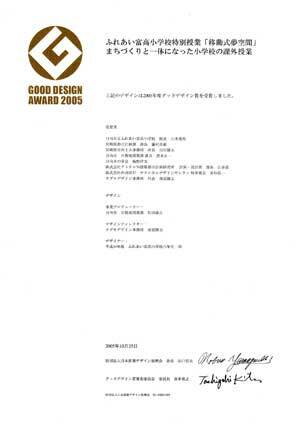 This was the first time that elementary school students won a Good Design Award. The judge’s comment was “The designer becomes the subject in this educational program where the government, businesses, the school and the residents are all working as one. Daring to use low-tech tools to teach young children has particular significance for our society. The impressive result is that everyone involved energetically participated.” This news was of course very big in the local newspapers and Miyazaki Prefecture but it spread quickly to the educational community and has also been widely praised across a wide range of disciplines.? Fig.3-1: The students returned after graduation to celebrate winning the Good Design Award. 授業終了後に児童に感想文を書いてもらったものを見てみると、多くの児童が「協力することの大切さ」「感謝の心を持つようになった」といった感想を述べている。このことはまちづくりやものづくりが多くの人が関わってできていることを体感したもので、このような気持ちを育んだこの授業は、まちづくりだけでなく、教育という分野においても大きな成果を得たと言える。それぞれの児童が描いた夢が現実のものとなりそれが地域の人々に受け入れられ、喜ばれるというまちづくり、ものづくりの醍醐味を経験できたことは、児童の将来にとっても、日向のまちづくりの将来にとっても新しい可能性を発掘できたのではないだろうか。この授業では自分たちのふるさとについての見識を深めるだけでなく、産業の構造やものづくり、まちづくりに何が必要なのか、社会的意義を学習することができた。さらに児童だけでなく、保護者、教師、講師、地場の技術者、地域の住民、県や市の職員、様々な関係者が一丸となって成し遂げた成果に、共に感動しているところが素晴らしい。保護者へのアンケートを見ると、回答者の９割近くの保護者がこの課外授業を支持し、継続的な開催を望んでいる。 Looking at the essays that the children wrote after the course, many of them wrote things like “It is important to cooperate” and “ I learned how to be appreciative”. These are things that they were able to experience by being involved with urban developers and manufacturers. Being able to experience these feelings in this class does not only apply to urban development but it can be said that it is a positive result for the field of education as a whole. Each of the children got to see the dreams that they put down on paper realized and the people of the town were very impressed with the end product. This is a great example of urban development that makes you feel happy. This chance for the children to experience the thrill of producing something opens up a new realm of possibilities for the children’s future as well as for the future development of Hyuga. Not only did this course deepen the children’s understanding of their town, it also gave them an understanding of the structure of industry and production, and what is needed for urban development. Overall, it was a socially significant learning experience. It is wonderful that many types of people; children, parents, teachers, instructors, local engineers, local residents, prefecture and city employees, all came together and were moved by their accomplishments. In a questionnaire given to parents, 90 percent said that they support these kinds of extracurricular courses and hope that they will be held on a regular basis in the future. この授業の後、日向市のイベントには、必ず児童たちが創った移動式夢空間が登場し、人気を博している。さらに同じような杉の屋台が増殖しており、地域の風物詩的な様相を醸し出している。まちづくり課外授業に始まった地元の杉材で創った屋台を市民がしっかり使いこなして発展させており、市民の目が自分たちの街、まちづくりに向き始めている。ここでも今回の課外授業がもたらし輪を広げていった、まちづくりのための新しい可能性を確認することができる。日向市の貸し出し記録を見ると２００５年の２月を皮切りに、２００７年４月までのほぼ２年間の間に、１５のイベントで児童たちの創った移動式夢空間が活躍している。子供たちが持っている純粋で柔軟な発想が現実に形になってゆくことにより、今までにない、まちづくりと学校教育との連携がもたらされたのではないだろうか。 After the course finished, “Movable Dream Spaces” that the students made became very popular and were used at every Hyuga City event. 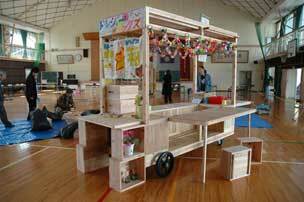 Also, cedar “Yatai” of similar design started becoming more and more common. “Movable Dream Spaces” have really become a poetic aspect of the area. The local residents have been taking full advantage of the “Yatai” made with local cedar from this urban development extracurricular course and their attention has shifted to their own city and toward further urban development. From the widespread influence of this extracurricular course, we can see new possibilities for urban development. 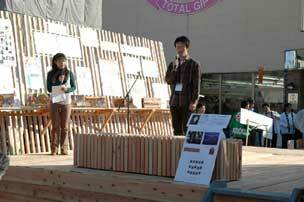 Looking at the Hyuga City records for the time from February 2005 to April 2007, about 2 years, “Movable Dream Spaces” that the children made were loaned out for 15 different events. The tangible realization of the pure and flexible ideas of the children has opened up an unprecedented conduit between urban development and school education.? 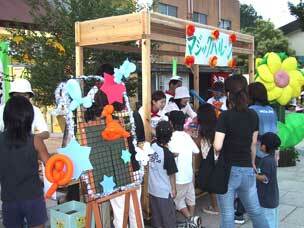 Fig.4: The “Movable Dream Space” is enlivening the festival in Hyuga City. このスギコレクションの活動にも「日向市活性化塾」での成功体験が大きな影響を勢いを与えており、継続して林業、製材業、木材加工業を中心に地域の経済を前進させてゆく活力を与えている。なお、宮崎県で始まったこの一連の動きは全国に波及していっている。 One of the factors of the success of this project was the design, and this is an important point. Cedar itself is a very appealing material, however, when using cedar to build “Yatai”, furniture and other things, it is often considered unfashionable and the end results are often old fashioned looking designs that don’t fit in modern cities. The children, in collaboration with working designers, created “Movable Dream Spaces” and the overwhelmingly positive response from the city residents is proof of the excellent level of design. At the same time the “Hyuga City Revitalization Course” was underway, a local lumber related group “Miyazaki Prefecture Men’s Lumber Association Federation”, which is the mother organization of the “Hyuga Kinome Association”, held a nationwide convention called “Cedar Collection 2004”, aimed at developing possibilities for the popularization of cedar. The design theme was “Cedar Train Station Furniture”. The winning works were to be used as “meeting benches” on the platform of the JR Hyuga City Station, scheduled to open in December 2006. Since this competition was directly connected to the urban development projects, the organizers started this project taking into consideration the effect of design on the popularization of cedar. In 2005, the event was moved to Miyazaki City with the theme being “The One Tsubo Cedar Space” (Tsubo: Japanese unit of measurement for floor space (about 3.3 square meters)). 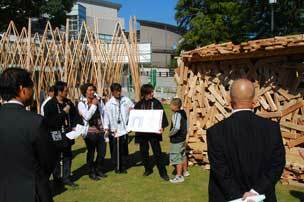 The theme for 2007 was “Digging Up the Public Potential of Cedar” and the event was held in Miyakonojo City. Every year, entries from all over Japan continue to grow and the event grows in size as the world’s interest in Japanese cedar increases. The successful experiences of the “Hyuga City Revitalization Course” have had a powerful effect on the activities of the “Cedar Collection” events, adding vitality to ongoing efforts to move the local economy forward by focusing on the forestry, sawing and lumber industries. These kinds of activities that started in Miyazaki Prefecture have spread to the entire country.